Approximately 40,000 new cases of uterine cancer are diagnosed in the United States each year. The overwhelming majority of these cases are endometrial cancers, malignancies that originate in the endometrial lining of the uterus. As few as 2 to 4 percent of cancers of the uterus develop in the connective tissues of the organ, in which case they are termed sarcomas. Uterine sarcomas are usually considered to be comprised of three basic types based upon the specific type of connective tissue they originate in. When cancer is initiated in the supportive framework known as the stroma, the tumor is referred to as an endometrial stromal sarcoma. If the muscular wall of the uterus, however, is the site of malignant transformation, the growth is generally classed as a leiomyosarcoma. The third type of sarcoma is usually called a uterine carcinosarcoma, but is also alternatively known as a malignant mixed mesodermal tumor or a malignant mixed müllerian tumor. 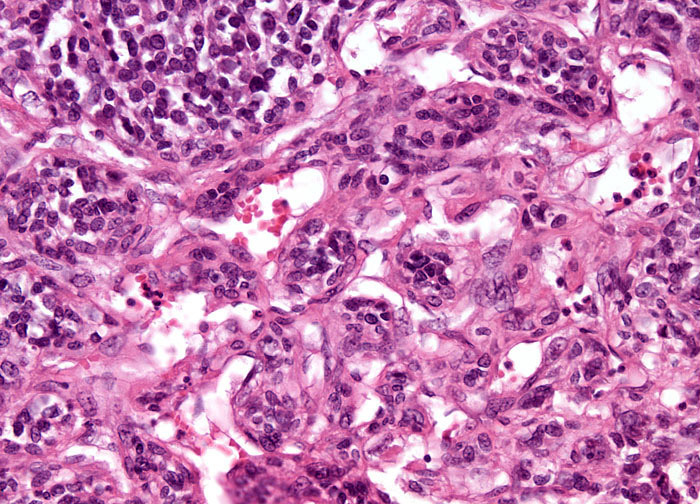 Though generally grouped with uterine sarcomas, this type of growth begins in the endometrium and exhibits characteristics of both sarcomas and carcinomas.